Coal is piled up at the the Blaschak Coal Corporation pit mine Dec. 4, 2018, in Mount Carmel, Pennsylvania. 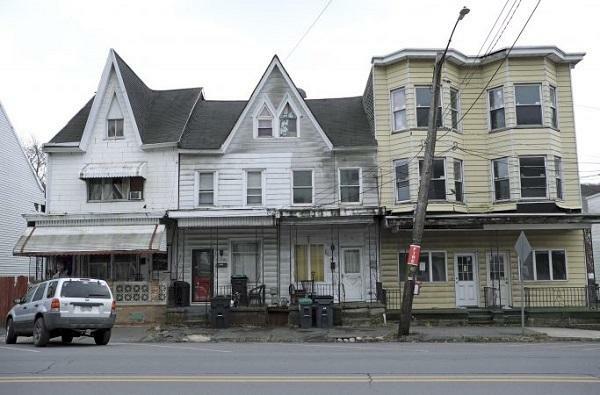 Scenes like this are common in the Schuylkill County borough -- dilapidated rowhomes, sooty with the exhaust of passing cars, empty glass storefronts, boomtowns that have seen better days. "We're not dead yet, we've still got a pulse in Mahanoy City," he said. "Thank God Trump lifted all the regulations on coal ... coal is gonna be king." Mahanoy City Borough Council President Thom Maziekas talks about the struggles of the town, which has a population of about 4,000 residents. From the campaign trail to today, President Donald Trump has promised he would bring back coal and manufacturing jobs to the United States -- and he's been specifically referencing Pennsylvania. "The miners of Pennsylvania, we're digging coal again," Trump said in June 2017. "When I campaigned for president, I said we'd end the war on coal and put our incredible miners -- and that's what you are, you're incredible -- back to work. "In the anthracite coal regions of Northeastern Pennsylvania, this optimism has been music to the ears of many. After all, coal created places like Mahanoy City. Anthracite is a particularly pure, high-heat, high-carbon form of coal that, in the United States, is only found in this region. In the early 1900s, over 200,000 people worked the mines around Mahanoy City, including many of the town's then 16,000 residents. A December day on a street in Mahanoy City. Many residents still use coal to heat their homes and Mahanoy City offers municipal ash collection. When asked about his age, Maziekas said proudly, "I was born on Johnny Mitchell Day" -- a holiday for the man who founded the United Mine Workers. It used to be a paid day off for miners here, but today, it's not celebrated like it used to be. A look at the the Blaschak Coal Corporation pit mine in Mount Carmel, Pennsylvania. He points to the Blaschak coal company, based at the edge of town, as proof of a Trump-fueled comeback. With the help of a $1 million state grant, Blaschak has re-opened a mine in nearby Mount Carmel -- the biggest mine redevelopment project in the region. "That's going to mean a lot of work," said Maziekas. "You can actually see the black there, that's the beginning of the coal seam coming out of the ground," Driscoll said. At some points, it's nearly 100 feet thick. Metallurgical coal, like anthracite, has taken a slightly different trajectory than the more common thermal coal, the kind used to generate electricity. Anthracite is instead used in home heating and metallurgy, like steel-making. While the rise of natural gas has continued to gut the thermal coal industry, the market for metallurgical coal is growing steadily -- though not to the levels of its heyday. Once, there were nearly 100 million tons of anthracite coal mined every year in Pennsylvania. Today, it's closer to 3 million tons. Driscoll knows the anthracite industry will never return to its peak, but he believes there's room for growth. "We think it could be 10 million tons [per year] and that would certainly be a major benefit to employment, to the economy, to building a future in the region," he said. 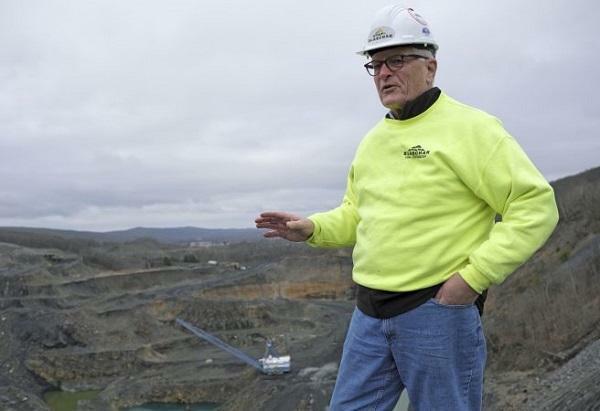 J. Greg Driscoll, president and CEO of Blaschak Corporation, stands atop the company's new pit mine in Mount Carmel. But what about today? Have Trump's actions impacted Blaschak's new mine and boosted local job growth? "Not directly," said Driscoll. "We have not seen a big impact from any changes in the past three to four years." But industry experts don't necessarily expect that to happen -- natural gas is still cheaper. But those changes won't affect anthracite. The only slashed regulation that has touched the industry so far, said Driscoll, is the end of the Stream Protection Rule, which prevented companies from dumping ash and waste into waterways. Nationwide, there has been a slight increase in mining jobs since Trump took office. But experts say that's due to market forces, not cuts to regulations. This isn't the only new mine to open in Pennsylvania in recent years. One in Somerset County took center stage when Trump referenced it while pulling out of the Paris climate accords in 2017. Yet, overall, according to the Pa. Department of Environmental Protection, the trend's still downward: After a slight uptick in 2015, there are now just 837 people employed in anthracite mining in the whole state. Given Trump's rhetoric, and news of mine openings, those facts can be confusing. For instance, when news of the Mount Carmel mine re-opening broke, local news stations made it sound like it would bring dozens of new jobs. There are about 30 people employed at the mine now, including Charlie Gasparetti, a load operator from Mount Carmel who's been in mining for 23 years. "This is a good job. It's a lot of coal," he said. "Knock on wood, it goes great and I should be able to get close to retirement on this job." "We try to make it clear that this is what's happening right now," he said. "There could be another 25 jobs, if we are able to get this developed and find a market." J. Greg Driscoll, president and CEO of Blaschak Coal Corporation, holds a block of coal as he gives a tour of the company's new pit mine Dec. 4, 2018, in Mount Carmel, Pennsylvania. People who know the coal industry say projects like Blaschak's maintain employment in the sector, a good thing for the economy. "Coal is not coming back. Coal in the U.S. will never come back," said Art Sullivan, a mining consultant in western Pennsylvania. He's worked in coal for 52 years, starting as a miner. He's says people in the country's coal regions have been misled. "Trump is a liar. Trump gave hope to a group of people I respect, admire, and have spent my working career with. He lied to them because they were desperate for hope," said Sullivan. 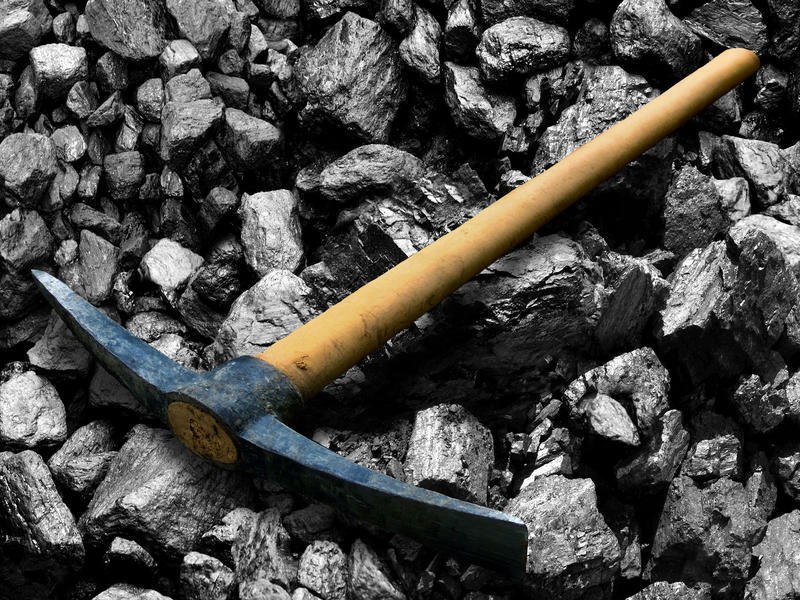 He and Blashak CEO Driscoll agree that the true hope for a new coal boom lies in innovation. Anthracite can be used in filtration and water purification. People are also experimenting with using it for manufacturing, and extracting its rare minerals -- all of which has the potential to create a new coal economy that's less tied to the energy industry. "There are known uses of this material that we need to pursue and see if we can't increase demand by broadening demand -- not just by looking for more of the same," said Driscoll. Like coal, manufacturing was also once a lifeblood of the area around Mahanoy City, with hundreds of small factories making products like cigars, plastics, and thermal underwear. Frank Zukas, president of the Schuylkill Economic Development Corporation, grew up in the region. In the 1960s and 1970s, he watched factories close as manufacturing jobs -- particularly in textiles -- moved overseas. "That industry disappeared completely," he said. Fifteen Fortune 500 companies now have facilities in Schuylkill County's 772 square miles, making everything from aircraft parts to plastic film for medical devices, and residents and local experts say these jobs are plentiful in the region. Schuylkill County still falls well below the statewide median household income -- $47,642 compared to $56,951 -- and it ranks 57 out of the state's 67 counties for unemployment. "I just think economy as a whole is doing better," he said. "Local papers are peppered with job listings." "The temp agencies send me jobs nearly every day that are trying to hire," he said. "The companies are begging people to take overtime. I've never seen supervisors get mad [that] you won't take overtime until I moved here." In his experience, the jobs pay better than his offerings in Philadelphia -- between $10 and 17 an hour, he said. Jennifer Wakeman, executive director of DRIVE, an economic development corporation serving nearby Columbia and Montour counties, says education is a key component of this region's future. Jobs are here, she says, but workers often aren't. "We spend a lot of time working with either community colleges or trade and technical schools to really create this pipeline of workers, but that's a long term process," she said. "I don't think we'll see the results of that for another five, eight, 10 years." "There's some re-education that has to happen," she said. "I'm of the generation that was told, 'You're going to college, you're going to college, you're going to college.' Because parents or grandparents were in manufacturing and they lost pensions, or lost their job because it was shipped off somewhere out of the U.S."
A look at West Centre Street on Dec. 4, 2018, in Mahanoy City, Pennsylvania. The question now is whether a stable coal industry and growing manufacturing base can turn around towns like Mahanoy City, with their shrinking populations and crumbling housing. Zukas says unless these townships can fix their blight problems, that's unlikely. "Not to the extent decline is taking place. If we're losing a couple thousand people a decade, I don't think those numbers are reversing," he said. 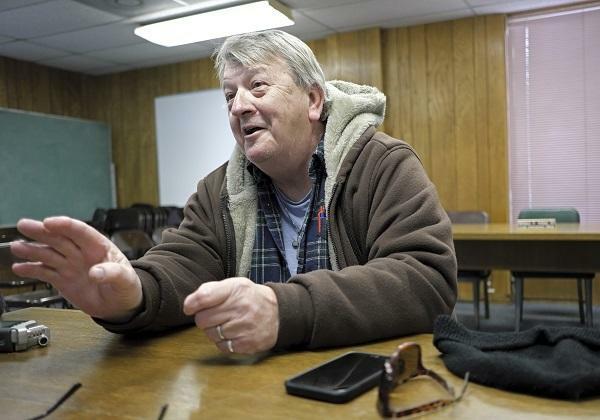 When people do find better-paying jobs here, he said, they tend to move out of the townships, onto larger plots of land -- away from the blight of towns like Mahanoy City. At borough council headquarters in a second interview, Maziekas was surprised to learn Blaschak hadn't created new jobs. "I just assumed that they're going to be out there doing that," he said. "Everything is going to turn around, eventually," he said. "Not just Mahanoy City -- I do believe the small towns in these areas, we are making the circle and we are coming back." Keystone Crossroads is a statewide reporting collaborative of WITF, WPSU and WESA, led by WHYY. Courtney Haveman developed a passion for skin care while working at a tanning salon.